Ethiopian food ranks among my favorites in the world. Humble yet sophisticated, complex yet comforting, this ancient cuisine has a unique style, with its dynamic balance among dozens of exotic spices. Most Ethiopian meals center around a large communal platter, covered with a spongy sourdough crepe called Injera, made originally from the African grain teff. Teff contains its own symbiotic yeast, which naturally ferments as the Injera batter sits overnight. Various sauce-based dishes pool around the injera. Guests eat with their right hand, tearing fresh pieces of crepe for edible utensils to scoop sauces with their fingers. The best part comes toward the end, when the saturated injera underneath gets devoured. This deeply flavored cuisine has something to offer vegetarians and carnivores alike, especially those who like their food spicy hot. 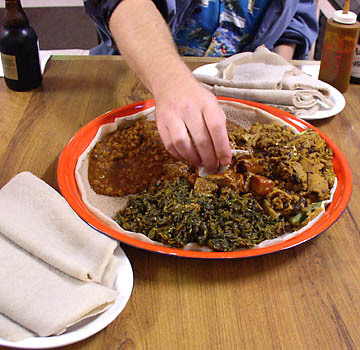 I have searched for Ethopian restaurants in nearby towns, and the closest I have found are in San Jose. For many years I've enjoyed the Red Sea on North First Street, with its light style and broad menu. Last year I discovered the Lunch Box, a tiny low-key café that renewed my appreciation for this satisfying food. While its menu has fewer choices than the Red Sea, its flavors are more intense. The Lunch Box won't attract every casual passerby. Its unadorned exterior sits almost invisible in a transitional neighborhood on busy San Carlos Street, a few blocks south of Bascom. Inside you'll find seven wooden tables, plastic booths, metal chairs on white linoleum floor. Ethiopian pop music percolates from a TV above the fridge. Most of the customers here speak Ethiopian, and a familiar community vibe pervades the air. Groups of friends come to linger and talk over a slow meal and tea or strong coffee. 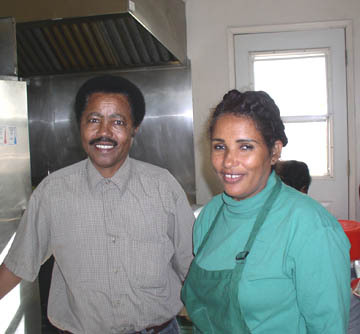 Husband and wife owners Ferede Negash and Lielti Mesfin greet all comers warmly and serve them like family. I felt welcome in this funky convivial atmosphere. Once or twice at the start, language gaps led to awkward moments while ordering, but in every case the excellent food compensated for my stumbling. The food here sometimes takes a while to prepare, so I don't come when in a hurry. I keep returning, because the food is addictive. After skimming the milk solids off heated butter, the oily portion remains, which won't easily burn. Spices like turmeric, fenugreek, cardamom, clove and cumin then get added along with ginger, onions, garlic and more. This simmers for 15 minutes to fully integrate the flavors. The resulting oil provides a deeply complex bed of flavors that guides the direction of every dish. The Lunch Box menu lacks chicken dishes, like the ubiquitous doro wat found in most Ethiopian restaurants. Nor does it feature fish. Aside from one excellent lamb dish (Lamb Tibs at $8.31), beef is the meat of choice at the Lunch Box. I rarely eat raw beef, but I wanted to try the Gored Gored ($7.62) in its purest form. You can order this spiced beef raw or cooked. It arrives as a generous stack of tender lean cubes coated in a blend of dry Berber spices. I could taste allspice, cloves, cinnamon and cardamon under the slow burn of red pepper. The sweet clarity of the raw steak told me that the Lunchbox uses top quality beef, impeccably fresh. Later I tried the dish cooked rare, and found it equally excellent, still perfectly soft and red inside with a browned exterior more comforting to American expectations. At the other end of the beef spectrum, Quanta Fitfit ($7.39) employs slivers of spiced beef jerky cooked in a red pepper stew, then blended with strips of injera. The bread soaks up sauce and adds soft textures to the chewey crumbs of earthy aged meat. Vegetarian dishes provide the foundation for meals at the Lunchbox, whether alone or accompanying meat. With deep flavors and high-protein ingredients, these dishes thoroughly satisfy on their own. Among my favorites, Gomen ($6.47) offers deep smokey fragrances that permeate soft collard greens, with minced garlic, onions, and sweet peppers. The aromatic smokiness reminds me of mild chipotle peppers. Basic protein staples (all for $6.47) include Miser Kik, a spicy red lentil sauce with strips of fresh hot peppers; Ater Kik, a similar dish using chickpeas; or Miten Shiro, made with roasted powdered chickpeas. Alicha Atkilt ($7.85) is a mild savory blend of cabbage, carrots, potatoes and onions. 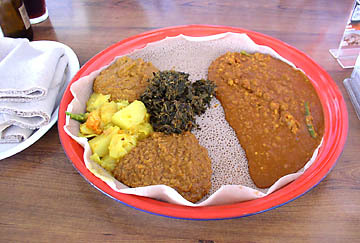 Foul ($5.08, pronounced "fool") provides a variation in the pattern of sauce on injera. This fresh tasting fava bean dip arrives separately in a large bowl with two crisp warm French bread rolls. Chopped raw tomatoes, onions and jalapeños augment the beans, with a dollop of sour cream and the fragrant spiced butter. It took me a few visits to figure out certain menu items. One of these is a sampler, the others blend selected dishes together. My initial attempt to pick the dishes led to brief confusion. I learned to let the kitchen decide. The Vegetarian Combo ($7.85) offers a great way to sample four of the meatless dishes. I enjoyed generous portions of collard greens, potatoes, chickpeas and lentils. On other days, the selection may vary. Bosena ($7.02) offers a blend of the beef stew (Kay Tibs) with either lentils or chickpeas. The result is rich and delicious. Bosena Shiro ($7.39) blends the kay tibs with a spicy paste of powdered chickpeas. If you mention that you like hot spices, these dishes will come mixed with raw slices of feisty jalapeño peppers. Those fresh green jalapeños pop up on many platters. To augment the exquisite burn, I learned to request a squirt bottle of the flavorful house pepper sauce. Thick and intense, this dark red sauce can bring sweat to the brow, but somehow doesn't overpower the food. Imported or domestic beers cost only $2.08, Ethiopian beer $2.54. I strongly recommend the rare Hakim Stout, a malty dark beer that pairs expertly with spicy strong flavors. Ethiopian honey wine ($2.79) called tej, also clears the palate with its light residual sweetness. I cherish restaurants like the Lunchbox, uncut gems that shine despite rough externals. With its authentic and expertly prepared food, the Lunchbox deserves a trek off the habitual path. Culinary discoveries await the adventurous. Open 7 days, 9 a.m. to 9 p.m.